In fall, one of our treasured family traditions is to spend an evening carving pumpkins while we tell our kids the pumpkin prayer and pumpkin gospel. Whether or not you celebrate Halloween, I’m guessing that one of your fall family activities includes time to carve pumpkins too? If so, you’ll love sharing the Christian pumpkin story with them! I can’t wait to tell you more about the pumpkin gospel and tell you about an awesome pumpkin gospel printable resource so you can easily share about God’s salvation in a fun and exciting way that kids love. What Is the Pumpkin Prayer? The pumpkin prayer (or the pumpkin gospel) has been around in various forms for a while. 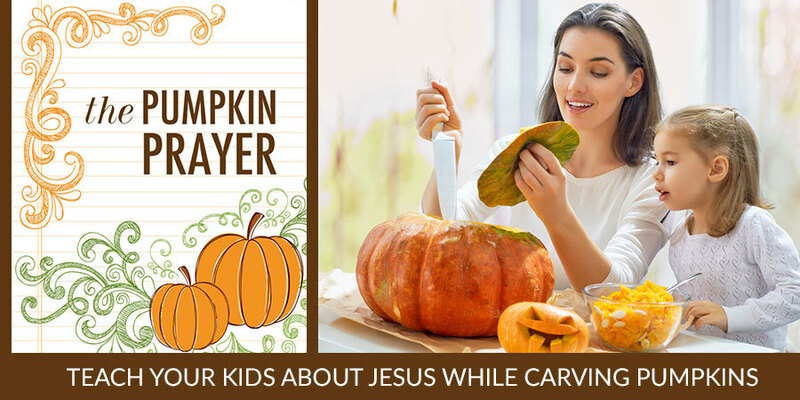 In a nutshell, it is a Bible lesson that tells the story of salvation as kids are carving a fall pumpkin. 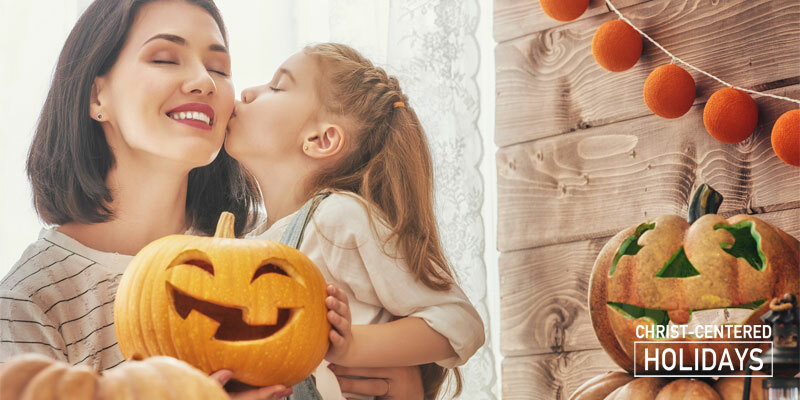 Whether or not your family celebrates Halloween, teaching kids the pumpkin prayer while carving pumpkins is a wonderful fall activity that can also give them a new insight about a relationship with God. 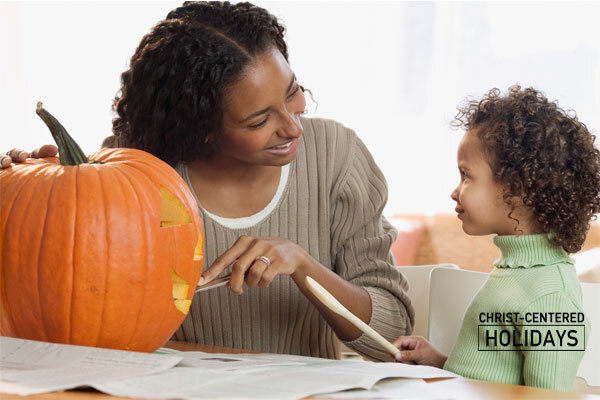 Kids are introduced to the concept that, just like a Halloween pumpkin being carved into a Jack O’Lantern, they are chosen by God, are cleaned by him, are given a new identity in Christ and then are made to be a light to shine for God. These Pumpkin Prayer Printables tell the pumpkin gospel in four steps and then give a pre-written prayer at the end. 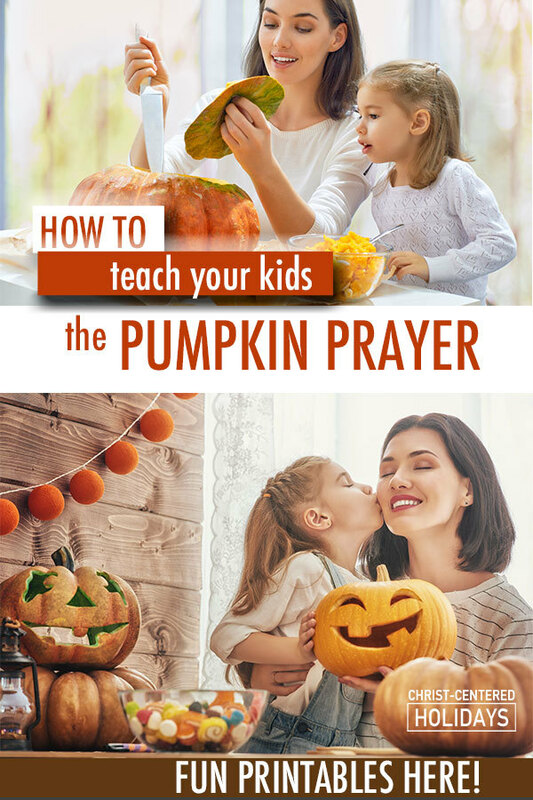 I wanted a way to showcase the powerful truths of the pumpkin gospel into a well-designed pumpkin prayer printable that our family could use both while we carve Jack O Lanterns and as a memorable evangelistic tool for sharing about Christ during Halloween. You may see other pumpkin prayer resources out there, but honestly, I haven’t seen any pumpkin gospel poems or pumpkin prayer resources like these! They’re really pretty! 🙂 And kiddos LOVE them! 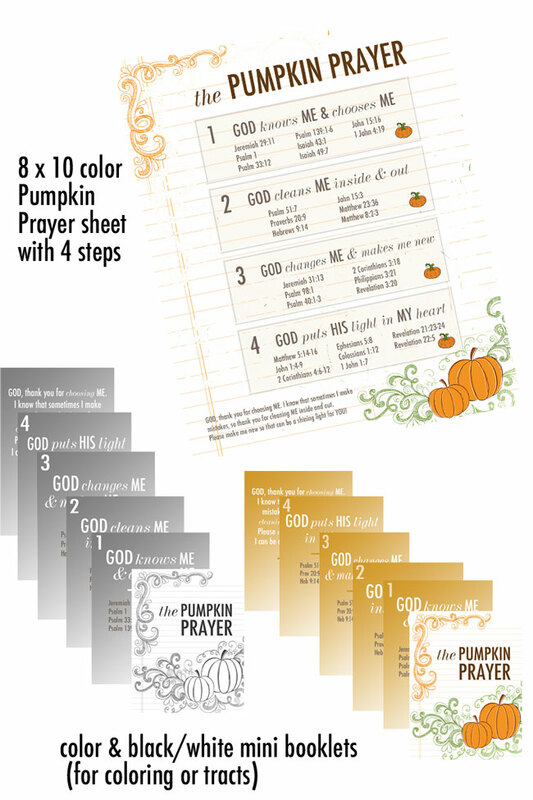 Did you get the Pumpkin Prayer Printables? You can go here to see more details, or just click the “Buy Now” button below. Got them? OK, cool! Let me show you how to use these adorable fall printables with your family! When the pumpkins are completed, close in prayer. P.S. A sample prayer is included in the Pumpkin Prayer resources, along with detailed information on the actions for each step. There’s also 28 Bible verses included as reference (and you can read these to the kids as part of the Pumpkin Gospel presentation). Make this process super easy (and fun for your kids)! Download the Pumpkin Gospel Printable and instructions here. Afterwards, connect with each child individually to make sure he understood the pumpkin bible lesson and ask if he have any questions. You can also ask if he would like God to transform him like he just transformed his pumpkin. If so, lead him in a prayer of salvation like this one. How Can I Adapt The Pumpkin Gospel to Kids of Various Ages? Make a Pumpkin Prayer Banner. Print and cut out the color copies of the mini-booklet. Laminate each piece and hang the pieces on a ribbon or piece of jute using clothespins. Make a Pumpkin Prayer Mini Coloring Book. Print out the black and white sheet of the pages and have kids cut them out. Staple them together into a mini coloring book and encourage the kids to color in each picture. Create Pumpkin Gospel Tracts. Print out either the color or black and white pages and hand these out to trick or treaters. Share the Pumpkin Prayer with other families. Host a pumpkin carving party with a few other families. Go through the pumpkin prayer together as you carve your pumpkins. Create mini coloring books from the pages and encourage kids to color them in as they enjoy a fun pumpkin dessert like this one. Don’t you love how this fun family activity easily brings Christ into your fall traditions? I know your kids will enjoy this Christian pumpkin story as much as mine do! If you haven’t downloaded the resource, go here to get your copy! These beautiful pumpkin gospel story printables make it easy and simple for you to teach your kids the pumpkin prayer. Don’t miss this wonderful chance to share about Christ with your kids while you carve pumpkins! 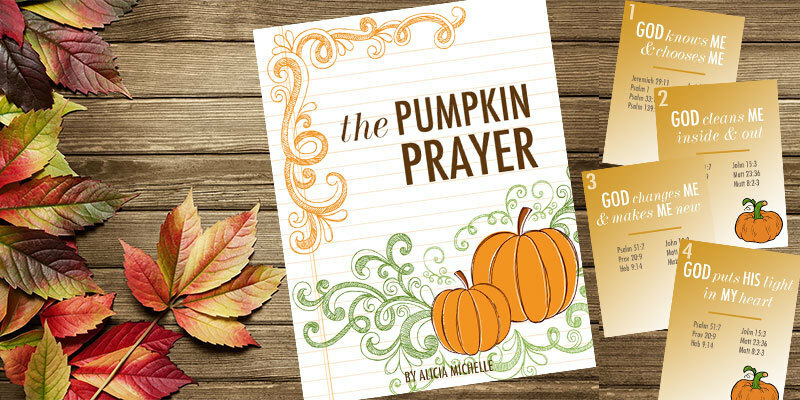 Don’t forget to grab your Pumpkin Prayer resources here!